Good morning. How was your weekend? Here in NC, we got some snow on Saturday evening. It was very exciting, especially for the kids. We had a big snowball fight in the back yard and my husband pulled the kids around on their new sled for a bit. Most of it's gone now, except on our back deck where the sun rarely shines. Hopefully this early snow doesn't mean we're in for a snowy winter! Last week, I did a lot of reading but didn't do much writing. Sorry about that! Part of the problem is that I started reading some books that I have for book tours later in the month, so I can't put up the reviews yet! I did review some Hanukkah books for kids. Happy Hanukkah to those of you who are celebrating! I completed Hoodoo Sea by Rolf Hitzer, but you'll have to wait until December 17th for my review! It's an interesting sci-fi novel that kept my attention to the very end. I'm just about done with Patch by Mucheru Njaga. I have to say I don't generally read young adult books, but this one is excellent! I can't wait to finish it and see how everything turns out. Watch for my review later this week! I'm still reading A Note from an Old Acquaintance by Bill Walker. I'm also reading The Active, Creative Child by Stephanie D. Vlahov. I have a couple books to choose from next, so I'm not sure yet which I'll pick up. I guess you'll have to wait until next week to find out! I'm not reading much right now because I was working on my papers. I hope to read Patch soon so glad you liked it. Hope you have a great week! Well, I know I'm curious which books you'll read next! 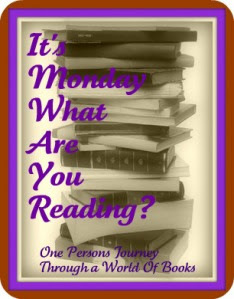 My Monday Reading is up too! Wow, you got snow already in NC?? My kids are dying for snow, but it's rare in DE before January. Meanwhile, my family up in Rochester, NY, has had lots already! Sounds like you're enjoying some good books lately - you sound excited - I look forward to your reviews. Don't you love that feeling of choosing your next book to read? Perusing all the choices and deciding what sounds good? I do!